– Place crispy brown rice cereal in a food processor and pulse until no large crispy chunks remain. – In a small sauce pan combine peanut butter, brown rice syrup and a good pinch of sea salt, mix well over low heat until well combined. – In a large mixing bowl combine peanut butter syrup and crispy brown rice cereal. Mix well. 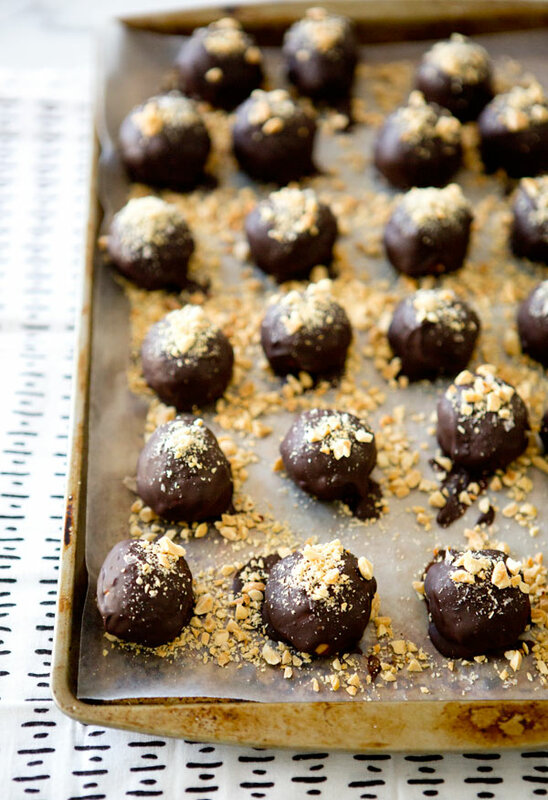 Form mixture into 1″ balls, placing on a baking sheet lined with wax paper. – Place chocolate and almond milk in a double boiler over medium low heat, stirring to combine until melted. Set heat to low. 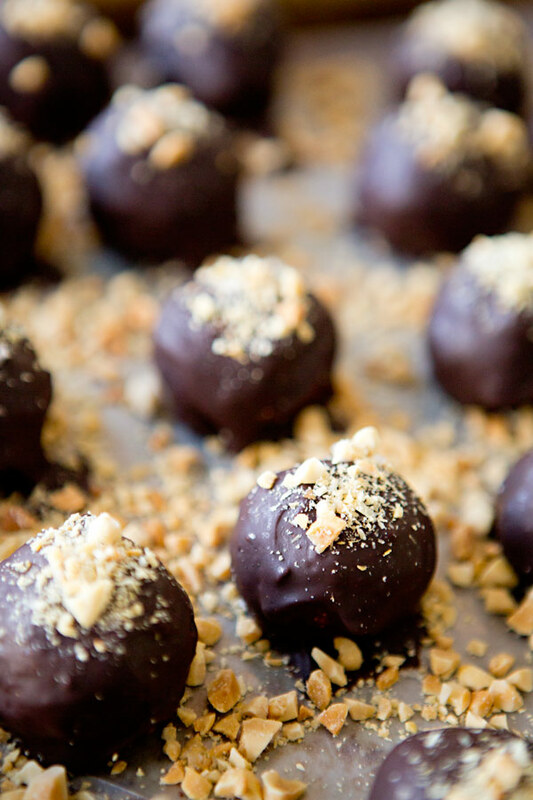 – Using a spoon dip peanut butter balls into chocolate, covering completely, and return to baking sheet. – Sprinkle with maldon salt and finely chopped peanuts. – Place in refrigerator for at least 2 hours to set. Store in refrigerator with wax paper separating layers. Oh yeah. I can understand the marrying addictiveness of these babies just from the pictures!!! Delish!! these look so wonderful, sarah! i am so inspired by how you create decadent foods that are vegan and gf. i vote for a cookbook also! i'm dying over here. 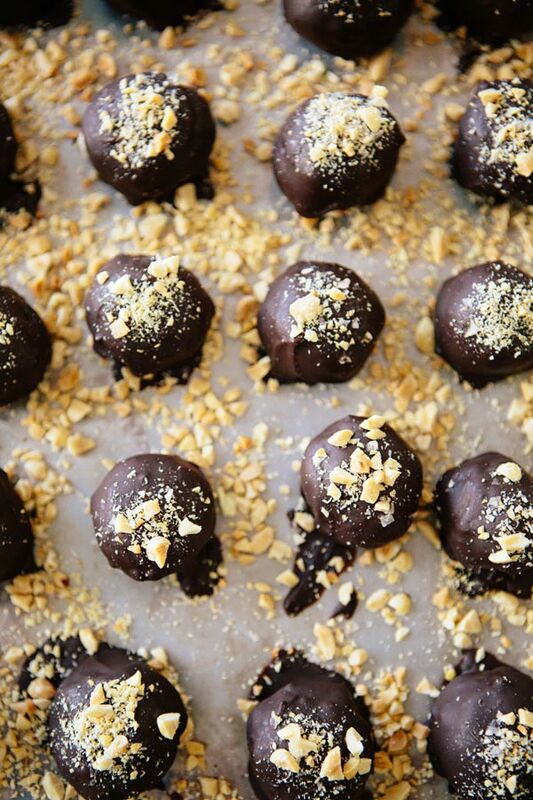 those crushed peanuts just totally take these babies to the next level. i want to EAT THEM ALL. OMG, I want to go home and make these on my lunch break! This is the kind of afternoon pick-me-up I needed. Love this recipe! OMG…my little darlings will thing I am a superhero when they try these! Happy Nesting. Oh…my goodness. Seriously trying these ASAP. So excited!! omg!! these sound amazing and pretty easy as far as ingredients go. i make quite a few vegan desserts and sometimes it's tough to justify using large amounts of maple syrup, brown rice syrup etc. but this is doable! anything with peanut butter and chocolate ya know? it just can't be bad. thank you for sharing, i will be making these tomorrow! YUM!!!! I must make these asap. Made em! Delicious and easy. My son loves them too. The perfect treat. Thanks for sharing all of your yummy recipes. These look fantastic and interesting combo with the rice cereal. I've been mentally making my own chocolate peanut butter cup in my head for a couple of weeks. Thanks for the inspiration here! Hi there…what if I didn't want to use vegan chips, but wanted to use raw cacao powder and coconut oil instead? These are INCREDIBLE!!!!! Made them over the weekendso delighted to discover your lovely blog Sarah, hooray!!! Thanks for sharing this divine recipe Sarah! 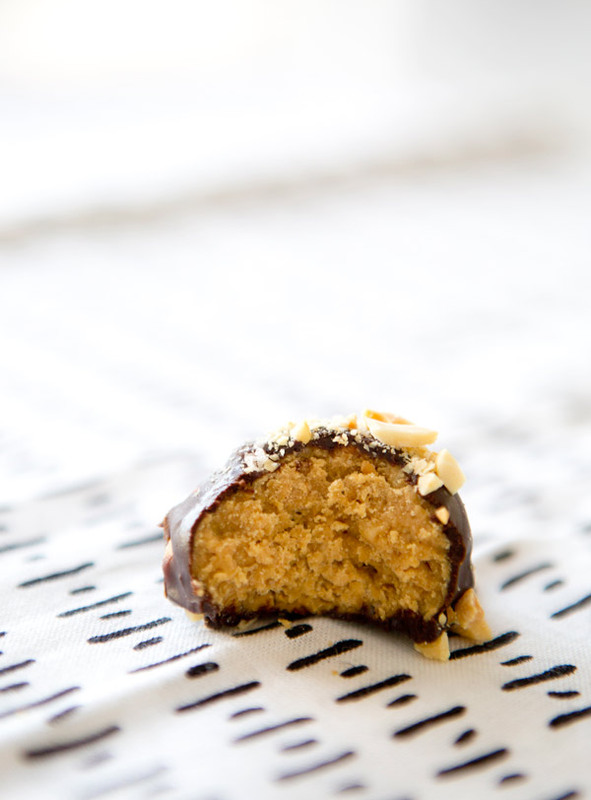 I made these yesterday along with 2 of your other recipes – all a success and delicious!